The Alumni Auditorium, the Forum, Exeter University. Inter Faith Week took place in 2015 over the period 15-22 November. As well as the ‘Teaching British Values?’ conference on 14 November, DFBF held or attended several further events. The first group’s training was completed in a final session held on Saturday 21 November 2015 at the Exeter Community Centre, St David’s Hill. The aim of the programme was to improve the quality of faith speakers being sent into schools, colleges and community settings, in the hope that in time there might be a bank of DFBF trained people these bodies might confidently call upon to provide this important service. After two previous Saturdays of training in October, trainees arrived for their final session in inter-faith week having just, for the most part, undertaken a classroom placement to put into practice what they had been learning so far. The programme began with an introduction to the education context, followed in week two by a session on presentation skills. Participants attending came from a wide range of faith and belief backgrounds, including Buddhist, Bahá’i, Christian, Hindu, Jewish and Muslim. Those taking part travelled from across Devon, and plans are well advanced to provide the next series of workshops in March 2016. Dean Jonathan Draper visited Exeter Mosque on Tuesday 17 November where, after attending Midday prayers, he spoke to a significant gathering of Muslims in the Mosque’s community room. His words were well received and were followed by a Questions and Answers session. 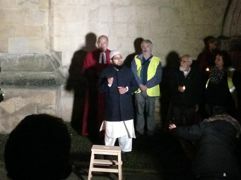 Two days later, on Thursday 19 November, Imam Mohammed Abrar visited the Cathedral where he attended Evensong. Afterwards he addressed an open Cathedral meeting in the Sacristy where around forty people heard him speak. Both conversations were particularly pertinent given the terrorist attacks in Paris the previous Friday. Bishop Sarah Mullally also visited the Mosque on the Thursday, the Imam having arranged for a number of Muslim women to meet her along with himself. This was visit was covered by ITV. In the course of the evening the Dean and Imam held a private conversation, recorded for transmission by BBC Radio Devon on the Sunday morning! Also on the Thursday evening, around 200 people progressed from Exeter Civic Centre to the Cathedral to express a desire for peace in the wake of the events in Paris the previous Friday. This attracted BBC coverage. A College teaching session in Exmouth, and a Parish over-dinner talk focusing on Islam in the Escot, Feniton and Payhembury group of churches also took place in the week.